Spring is known in song and verse as the time of hot-blooded romance, in both the human world and the world of nature. But it is also, and maybe even more so, the time of cold-blooded amphibian romance. Every year, in the early spring, astronomical numbers of amphibians race to court, mate, and lay eggs. If you live in a rural or suburban area of the northeastern U.S. or almost anywhere in Canada except the very far north, you have probably seen one of the most common and spectacular amphibian breeding frenzies – the yearly parade of the wood frogs. Wood frogs are about 1 3/8 to 2 3/4 inches (3.5 to 7 cm) and tan-colored, with a dark patch near each eye. Each spring, on the first warm, wet nights, wood frogs cross with great abandon any roads that come between them and the vernal pools where they urgently hope to mate and lay eggs. Vernal pools are those temporary ponds – sometimes puddles, really – that fill with water in the fall and winter and dry out by summer. Because these ponds dry out each year, they don’t have fish and other predators that would devour wood frog eggs and tadpoles. The sad thing is that in their rash haste to get across roads, millions of wood frogs end up being crushed by cars each spring. Maybe their reckless springtime exuberance can be forgiven when you know that wood frogs are one of only a handful of vertebrates that spend a good part of the winter frozen solid. Unlike mammals and birds, amphibians such as salamanders and frogs are cold-blooded, or ectothermic. They gain their body heat almost entirely from their environment. This means that when winter descends, they are in great danger of freezing. If the water in the cells of a salamander or frog were to freeze, it would expand and burst the cells. If this happens to enough cells and enough cells in critical places, the organism couldn't survive. That's why the vast majority of amphibians, like the spotted salamander, work hard to avoid the danger of freezing. In the late fall, they find burrows that run deep, below the frost line, and spend the winter in a dormant state. Wood frogs, however, are an exception. They are as cold-blooded as every other amphibian. They don't, however, go deep in winter, like the salamanders do. Wood frogs simply crawl under leaves or a fallen log, and wait out the winter. When the temperature goes far enough below freezing, wood frogs freeze solid as ice cubes. One amphibian expert calls them frogsicles. Wood frogs are able to survive freezing weather because they flood their bodies with glucose, a natural anti-freeze that lowers the freezing temperature of water. But this alone would not be enough to protect the frogs when the temperature really drops. So wood frogs have a mechanism that pumps glucose from the fluid in their blood vessels and between their cells and concentrates this anti-freeze inside the cells. As the temperature drops, the water outside the cells, where expansion won't create as much damage, freezes solid. The cells themselves don't freeze, and therefore don't burst, unless the temperature drops into single digits and stays there for weeks. That this rarely happens at the surface of the ground, especially when the ground is insulated by fallen leaves or snow, is proven by the fact that wood frogs are the most northern living amphibian of all. They are found throughout the northeastern United States, across most of Canada, and even above the Arctic Circle in Alaska. When a wood frog thaws, the water outside its cells melts and the glucose pumping mechanism reverses, restoring normal chemical balances. In just a couple of hours, they are hopping and croaking and looking for love. Despite all this freezing and thawing, wood frogs are highly successful creatures. Each female can lay more than 1,000 eggs, and a single vernal pool often contains 100,000 wood frog eggs. The tiny tadpoles that hatch from those eggs hold a surprise of their own. It was long thought that all frog tadpoles were the proverbial bottom feeders, living almost solely on algae. Recently, however, it has come to light that the tadpoles of many species are opportunistic predators, eating almost anything smaller than them, including other tadpoles. And wood frog tadpoles are among the most voracious. Usually, all the wood frogs in any particular location breed and lay their eggs within a week of each other. Tadpoles that hatch from eggs laid too late are eaten by the rapidly growing earlier hatchings. A study in North Carolina showed that American toads won't even risk laying their eggs in a pool where wood frog tadpoles are already in residence. Though they are found in almost all wooded areas in our region, wood frogs are very well camouflaged and hard to see in their non-breeding lives. You are most likely to encounter them on rainy spring nights, when they ignore the danger of traffic and cross roads with great abandon. At this time of year, you can also hear them just about anywhere there's standing water. Dr. Alan Richmond, herpetologist at the University of Massachusetts, remarks that "Many people mistake their croaking for ducks. 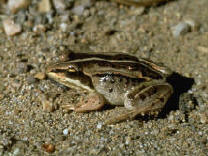 If you think you hear ducks quacking at night, it's almost certainly wood frogs." I like to think the wood frog's amazing trick of thawing from a solid freeze is symbolic of spring's yearly triumph over winter. For that reason, I nominate the wood frog's cold-blooded, romance-inspired, caution-to-the-wind hopping across our roads, and their nocturnal quacking, as the truest sign of spring.